Now that we’ve been talking nerdy for a few weeks, I’m sure it will come as no surprise to you that I’m completely obsessed with Downton Abbey. Not a day goes by that I don’t find myself wanting to hug Mr. Bates, scream at Lady Mary, or kiss the Dowager Countess full on the mouth! If you feel the same way, here’s a little something to keep you occupied while you wait for season three to start. I mean, who can resist the Dowager Countess and her amazing hats?! 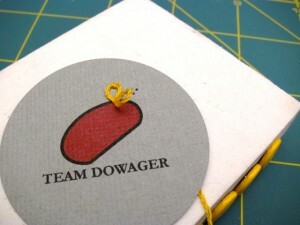 The following tutorial will show you how to make one Team Dowager badge. 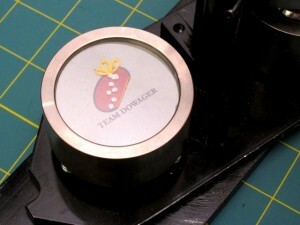 The printed template size is 1 ¾”, which is sized to fit a standard 1 ½” button maker. 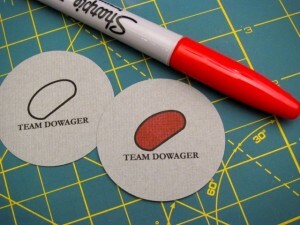 If you don’t have a button maker on hand, the template can also be used as-is to create a paper badge. Instructions for both options are included below. 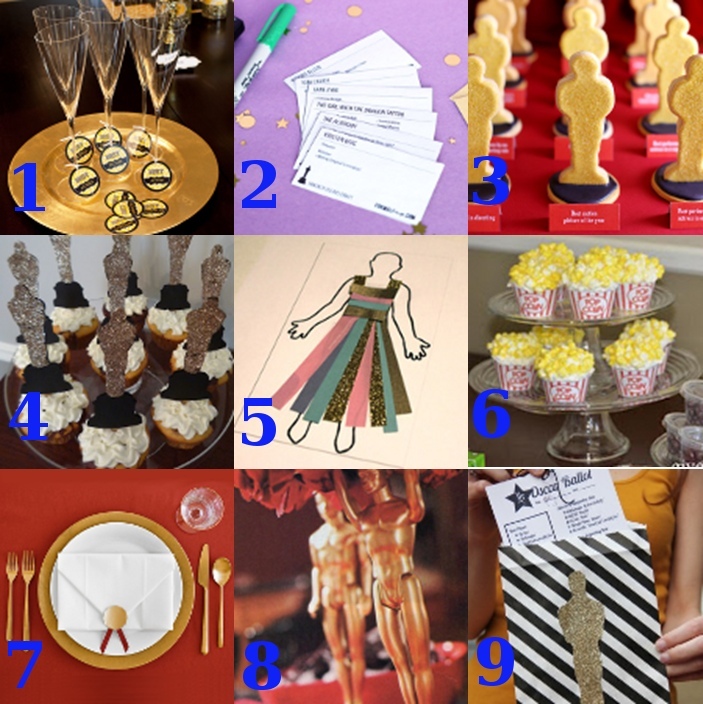 To make multiple badges, print additional templates on each piece of cardstock. 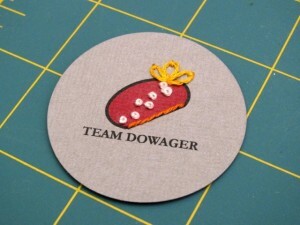 Print the Team Dowager hat template on cardstock and cut it out with your paper scissors. Then, using a permanent marker, fill in the hat shape with the color of your choice. 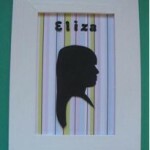 Select your first embroidery floss color and fasten one end to the back of the template with scotch tape. Thread your embroidery needle with the free end. Decorate the hat with your favorite embroidery stitches. I used french knot, stem stitch, and petal stitch, but you can use any stitch that suits your fancy! 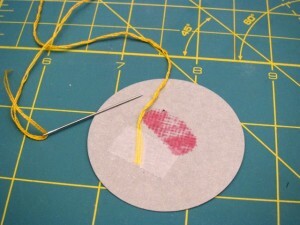 To avoid creasing the paper as you embroider, place the template on top of a foam block, then use a straight pin to punch the holes before making each stitch. Continue adding stitches until your hat is thoroughly decorated. When you’re done, cut off the excess floss length and use scotch tape to secure the ends to the back. If you don’t have a button maker or sticker machine on hand, seal the top with a decoupage medium like Mod Podge, then glue a pin back to the other side. 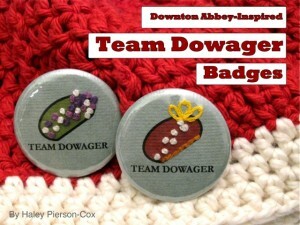 Are you on Team Dowager too? Leave a comment below and tell me how you’re going to decorate your badge! 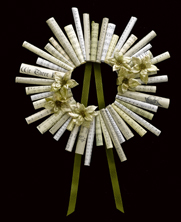 I just returned from a week long trip to Lake Geneva, Wisconsin where I counseled a cabin of high school girls at sleepaway camp. The week was exhausting but pretty incredible none the less. I’ll admit, I’m a bit out of touch with what it was like to be a high schooler, with the stress of boys and college preparations a thing of the past. One thing that I resonated with, however, is the meaning of a heartfelt friendship bracelet! The girls were weaving and knotting like crazy all week – churning out multiple bracelets for their friends on a daily basis. So if you hadn’t gotten the memo: friendship bracelets are IN! I hadn’t made a friendship bracelet, probably since before high school, but the idea of making a bracelet for someone as a symbol of your friendship is still pretty cool in my book. Many of the high school girls I hung out with this past week were capable of creating some pretty intricate designs for their friendship bracelets, and I was still stuck at the very basic level. But the idea behind the bracelet was still there. Here’s a new kind of friendship bracelet at Favecrafts, the design has a sort of woven, macrame feel to it and uses flexwire. Have fun creating bracelets for all your nearest and dearest! Anyone who was born in the 80s can appreciate the original Nintendo Entertainment System. There was nothing better than the original Mario Bros. game, which also came with duck hunt, a classic old school shooting game. I still love it. In fact, my boyfriend and I still own an original Nintendo (though we rarely play because 80s video games aren’t exactly compatible with plasma TVs). So in honor of my love for Mario and NES, here is a great Mario crochet blanket by Gege Crochet. You may not know this about me, but I am a HUGE fan of The Price is Right. I started watching at age 3 with my babysitter and was determined from then on to meet Bob Barker, get on the show, play Plinko and take home wads of cash. Mock me all you want, but the summer after my freshman year of college, I traveled to LA and waited in line for over 6 hours to be in the audience. Being at a taping took away all the glitz and glamour of the show and I didn’t win a dime, but I sat four rows away from Bob Barker and that was good enough for me. And even though I don’t think Carey can ever live up to Barker, Sarah of Totally Severe did a great job with this embroidered portrait. For more of our favorite embroidery projects, check out our Embroidery section. Make some Felt Corset Sachets for your drawers. Slated to come out February 6th, Coraline is a new stop-motion animation movie from Director Henry Selick (best known for directing The Nightmare Before Christmas). The movie is about a young girl (Dakota Fanning) who steps through her closet into an alternate version of her life. The other life closely mirrors her own, but is more fantastical. What is most interesting about the movie, however, is that all 150 sets and 250 puppets used in the movie are handmade. From popcorn cherry blossoms to nylon fishing line body hair, the crew does it all. Check out this Wired article that provides detailed images and explanations of how the set was designed. You can also check out the movie trailer here.